Jon Stewart Rips Into Apple Over Lost iPhone Debacle. That's Going To Leave A Mark. Over the last two weeks countless blog posts and articles have been written about the Gizmodo/iPhone leak and the subsequent police investigation. 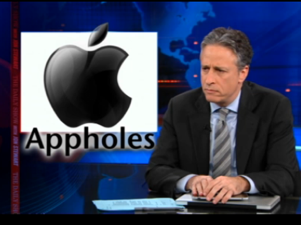 Few have been as scathing toward Apple as a segment that aired on tonight’s Daily Show. And while Apple has long made a habit of mostly ignoring what the press and media says about it, you can be sure this will get their attention. In the segment, host Jon Stewart lambasts Apple for the police raid on Gizmodo editor Jason Chen’s house, and the fact that Apple employees showed up on the doorstep of the guy who originally found the phone. Stewart’s report glosses over some important points in the case and gets a few details wrong. But ultimately that doesn’t really matter — Stewart’s audience probably doesn’t care if there’s a chance a crime was committed here. To them, a guy found a phone in the bar, photos of it were posted on the Internet, and Apple responded by siccing the authorities on them. And that right there is why Apple will probably be paying more attention to this than it did to myriad blog posts about the iPhone leak. Apple can often afford to ignore outraged tech bloggers and developers because its mainstream audience really doesn’t care about its inconsistent App Store policies or section 3.3.1 of the iPhone developer agreement. But the mainstream most definitely cares what Jon Stewart has to say, and I suspect the demographic watching this show plays a big part in making Apple’s laptops, iPhones, and iPods hits. And if Stewart is tearing into them now, imagine what will happen if Gizmodo, Chen, and the unnamed iPhone finder get charged with crimes.